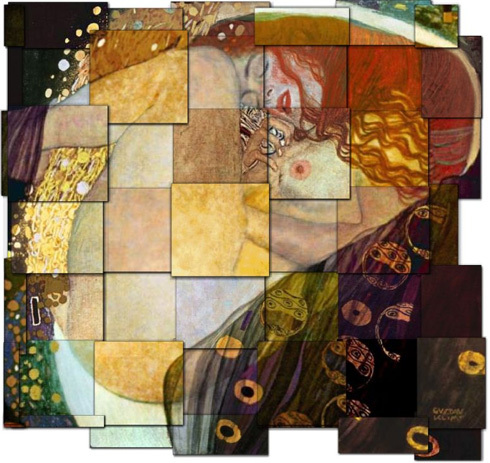 An internet search for a famous artwork such as Klimt's Danaë yields many images. Our collages visualize the discrepancies between these reproductions. 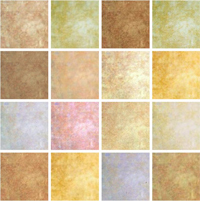 We were surprised at just how much colors varied. 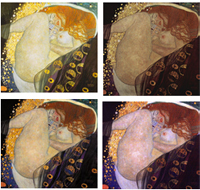 Below, for example, are sixteen different patches from the thigh of Danaë in Klimt's painting. The web can seem like the perfect museum, holding all the world's art. Type "Danae Klimt" into your favorite search engine, and you conjure up a high-resolution image of Gustav Klimt's Danaë: tan limbs, a shower of gold, red hair. Or did you find pink limbs? Or were they gray or even green? There's the rub: the seemingly perfect museum holds dozens of Danaës—with dozens of different palettes. Even the shape changes as reproductions are subtly cropped. Curious just how far reproductions stray from each other, we began an investigation. (Go directly to the results if you like.) For a set of famous artworks, we downloaded all the plausible copies we could find. Then we wrote software to reconstruct each artwork as a mosaic, a patchwork quilt where each patch comes from an individual copy. By juxtaposing the fragments of the reproductions we visualize their discrepancies. The image above shows the mosaic for Danaë. 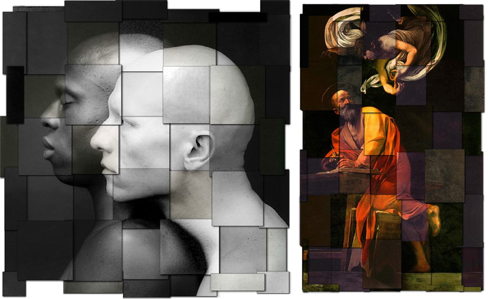 Below are mosaics made from a Mapplethorpe photo (note the slight deviations from pure grayscale!) and a Caravaggio. The discontinuities of color, texture and frame tell the story of the inaccuracies in reproduction, forming a tapestry of beautiful half-truths.